"The lovely temple and Justice Hall are set over water and lend a unique experience. We were with a guide who explained the significance of the painted ceilings and structures which was helpful in appreciating the temple. There is a Museum as well with interesting costumes and artifacts. The old adage of "Don't worry about finding the shopping in Bali; it will find you!" Certainly holds true here. The locals were very persistent trying to sell their ares." 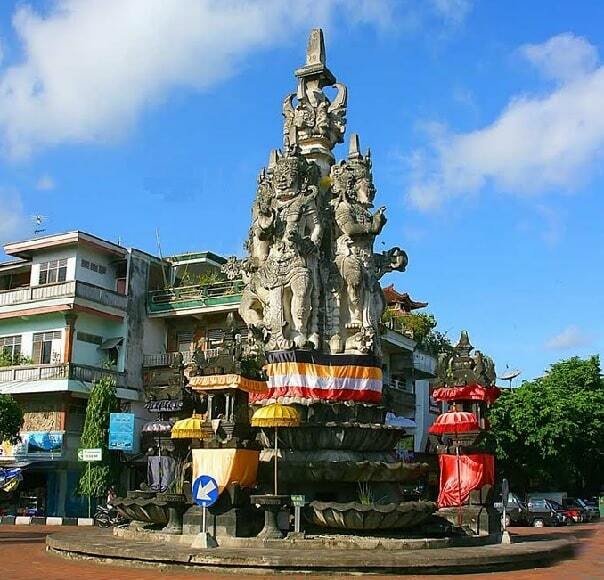 Klungkung is also known as Semarapura, is a town in East Bali. It's the administrative capital of the regency with the same name. 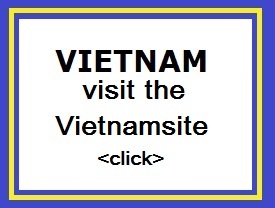 The town is of great historical, cultural, and artistic significance. 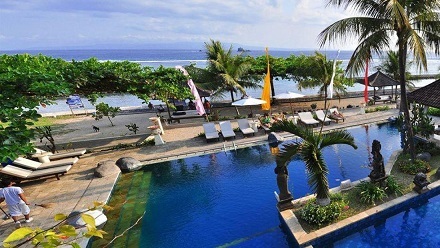 Klungkung is Bali's smallest district located between Gianyar and Karangasem, and includes the island of Nusa Penida, Nusa Lembongan and Ceningan. Klungklung was the base of the ancient Javanese Hindu Kingdom in Bali, from where the Balinese royalty of today draws its bloodline. 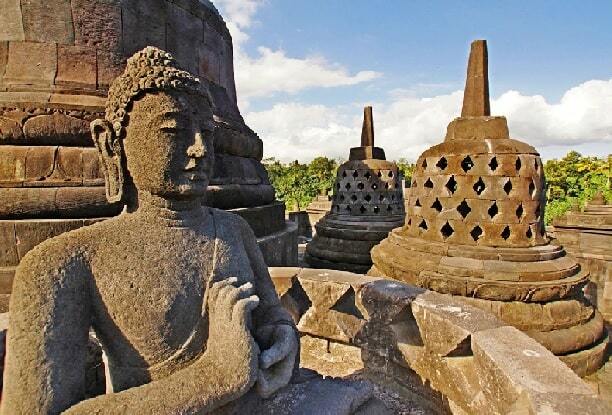 It is the oldest kingdom in Bali, with a most exalted Kings. The famous Kertha Gosa or Royal Court of Justice was built in Klungklung in the 18th century, displays one of Bali's masterpieces. It has a wonderfully made ceiling displaying one of Bali's masterpieces (murals portraying the punishment of hell and the rewards of heaven, and elaborated in thousands of panels of puppets) all on the ceiling. Klungklung's golden glory is forever captured in its floating pavilion, elaborate garden, and charming lotus ponds. Klungklung satisfies one's wish of returning to the glory of the ancient past. Kerta Gosa forms part of the Puri Semarapura royal palace and features two main structures: a grand hall or the namesake Bale Kerta Gosa with ceilings filled with Kamasan or wayang-style paintings and the Bale Kambang �floating hall�. Kerta Gosa complex dates back to 1686 when it was commissioned by Dewa Agung Jambe, then ruler of the Klungkung kingdom. Kerta Gosa has undergone a series of restorations in the past (the last one was in 2014) and it's one of Bali�s most important historical sites. Even though it's a national heritage site, Kerta Gosa is open for the public. Klungkung has a sprawling market and it's a vibrant hub of commerce and a meeting place for people of the region. You can easily spend an hour wandering about the warren of stalls on three levels. It's grimy, yes, but also endlessly fascinating. Huge straw baskets of lemons, limes, tomatoes and other produce are islands of colour amid the chaos. A plethora of locally made snacks are offered in profusion; try several. Glittering jewellery stalls crowd up against shops selling nothing but plastic buckets. Look for ikat vendors selling authentic fabric for a third of what you'd pay elsewhere. 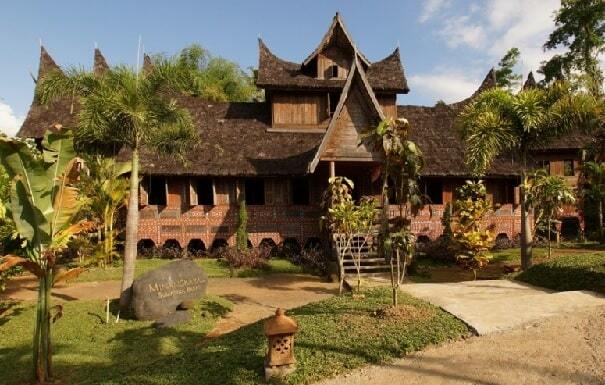 Museum Semarajaya is located in the Kerta Gosa complex, Semarapura, Bali. The building was erected by the Dutch for use as a high school. The museum has an interesting collection of archaeological and other pieces. There are exhibits of songket (silver- or gold-threaded cloth) weaving and palm toddy (palm wine) and palm-sugar extraction. Don't miss the moving display about the 1908 puputan, along with some interesting old photos of the royal court. The exhibit on salt-making gives you a good idea of the hard work involved. 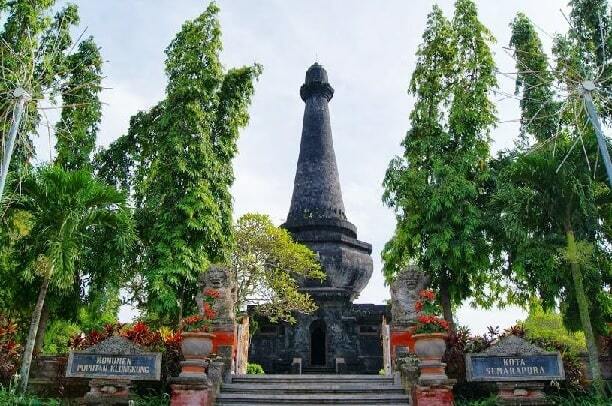 Puputan Klungkung Monument is a historic cenotaph with the Balinese architecture in a shape of Lingga Yoni, erected on a height of 28 meters from the base to its top, supported with a line of dioramas narrating the episode of the battle to the last blood shed within. It is located in Semarapura town, exactly Puputan Klungkung Monument is a historic cenotaph with the Balinese architecture in a shape of Lingga Yoni, erected on a height of 28 meters from the base to its top, supported with a line of dioramas narrating the episode of the battle to the last blood shed within. Not far from Klung Kung is the town of Sidan Gianyar, where Taman Nusa Cultural Park is located. This park is a cultural attraction in Bali. The park is 15 hectares. It is an open-air museum, which features 60 authentic traditional houses. There are also two exhibition rooms, showing art and tradition from Indonesia. The collection of traditional houses in the park from the archipelago of Indonesia is unique. The tour through the park gives an insight into Indonesia. You learn about the daily life of the locals over the centuries. Four of the settled houses are original, transported from the island of origin to the park and rebuilt on the spot. You make a passage through Papoa, Timor, Java, Sumatra, Moluccas, Flores, Sulawesi, Kalimantan, Lombok and unforgettable Bali. When visiting Taman Nusa Park, you will learn about Indonesia's cultural diversity.